Director/Screenplay – M. Night Shyamalan, Producers – Marc Bienstock, Jason Blum & M. Night Shyamalan, Photography – Mayse Alberti, Visual Effects – Dive, Special Effects Supervisor – Kurt Wunder, Production Design – Naaman Marshall. Production Company – Blinding Edge/Blumhouse Productions. Rebecca and Tyler Jamison are determined to go and stay with their maternal grandparents whom they have never met. Their mother has not seen her parents since she left home over an incident she will not discuss. While she heads off on a leisure cruise with her new boyfriend, the children catch a train to Masonville, Pennsylvania where they are picked up by the grandparents and taken to their farm. The kids both have video cameras and want to make a documentary about the trip. However, soon after arriving, they start to find the grandparents behaving weirdly, including the grandmother dementedly running around the hallway naked at night. Their mother tells them not to worry and puts it down to old age. However, the more they investigate, the more they believe something sinister is going on. M. Night Shymalan needs little introduction as the writer/director who came to attention with his third film The Sixth Sense (1999), which became a smash hit because of the talking point of its surprise left field ending. Shyamalan went onto a string of other films – Unbreakable (2000), Signs (2002) and The Village (2004) – but soon began to dispute with studios who were pigeonholing him as the talent who kept making surprise conceptual reversal endings and their creating big mystery promotional campaigns around them. It might also have escaped them that by the time of The Village, audiences were starting to find some of these twists lame. Given greater creative freedom as an independent, Shyamalan went onto make Lady in the Water (2006), The Happening (2008), The Last Airbender (2010) and After Earth (2013), as well as to produce The Night Chronicles 1: Devil (2010) and the tv series Wayward Pines (2015-8). Unfortunately, all of these, with the exception of Devil, started to receive terrible notices, with audiences switching off Shyamalan’s mysticism and constant accusations of him being big-headed. I will admit to sitting on the dividing line when it comes to M. Night Shyamalan. That he can direct well and create spooky, unexpected and often unworldly atmosphere there is no doubt – there is plenty of evidence of that in The Visit. He has ideas that are not uninteresting too – I don’t agree with the notion of predestination but it plays through many of his films in fascinating ways. He is constantly interrogating the idea of myth and meaning in the world. And when Shyamalan gets to create works set in different times and places, you cannot deny that he does so with an imagination. The other side of the coin is that some of these ideas cannot help but come off as half-baked – Bruce Willis’s mystical purpose revealed as a comic-book superhero in Unbreakable; the loopy match of faith, predestination, crop circles and alien invasion in Signs; the lame twist ending of The Village; Shyamalan casting himself as a writer with a great purpose in Lady in the Water; and then there was The Happening if anybody can actually figure out what that was meant to be about. I have happily defended Shyamalan through The Last Airbender and After Earth, which have attained some of the worst notices of his career, as they are undeniably interesting films. Part of the problem, one suspects, is the flash mob of the Twitterverse that descends on a work with instant ridicule and amid this babble we have lost any sense of giving a work some rope to prove itself. Seemingly stung by this string of bad notices and lukewarm box-office response, Shyamalan has joined forces with Jason Blum for The Visit. Blum and his Blumhouse production company have had a meteoric rise in the last few years with films such as Paranormal Activity (2007), Insidious (2010), Sinister (2012), The Purge (2013) and various sequels to these, among others. (See below for a full list of Blumhouse’s other films). They have a dictum of making each film on a medium budget, usually under $3 million. Shyamalan is probably the most high-profile director to choose to work for Blumhouse, unless you want to count Barry Levinson with The Bay (2012). Not only working with a limited budget, Shyamalan has also chosen to shoot The Visit as a Found Footage film. It is almost as though these strictures have acted as a liberating force for Shyamalan and allowed him to make what is easily one of his best films in some time. He has seemingly thrown off the controlled atmosphere of his earlier films, kicked his heels up and decided to go nuts. It is an entirely new M. Night Shyamalan we are seeing. In particular, The Visit is a comedy, not exactly a genre that you associate Shyamalan’s name with. Indeed, you could search all of Shyamalan’s other films in vain for anything that approaches comedy and come up empty-handed. All of this seems to have clicked with audiences who responded and gave The Visit some of the best notices that Shyamalan’s films have received in years. Not to mention that he unexpectedly revisits the left field conceptual reversal twist and comes up with a real doozy. 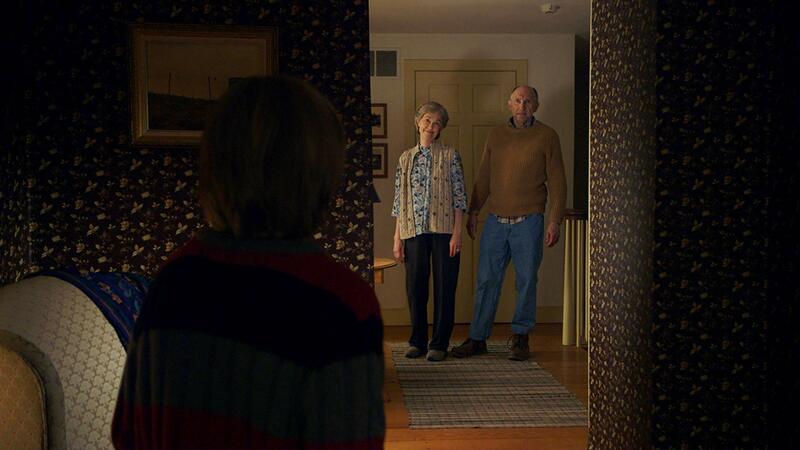 The Visit is an extremely funny film. At the same time as he is busy spooking us, Shyamalan also has the audience laughing at the wackiness of what is going on. What I responded to was the kids, especially Ed Oxenblould who bursts with energy and brightness and gives an hilarious performance, especially when it comes to his freestyle raps. One of the funniest parts of the film is how M. Night Shyamalan is not only making a Found Footage film but is also playing around with it meta-fictionally – the kids are constantly using film school jargonise and discussing ‘visual tension’, ‘focal length’, ‘mise-en-scene’ and meta-questions about the conception of what occurs outside the frame. Even when the kids are filming ordinary people, everyone they encounter seems to announce that they always had ambitions to act and launch into rehearsed lines. It is humour you suspect goes over the head over the average multiplex audience but it makes for one of the funniest Found Footage films to date. You are not even sure for some time what type of film that Shyamalan is making. When the grandmother starts unnervingly insisting that Olivia DeJonge get into the oven to clean it – a scene that featured prominently in the trailer – it feels like we are going to end up in the midst of some twisted modern version of Hansel and Gretel. Shyamalan creates a fascinating sense of mystery and throws in some intensely weird moments – the grandmother’s nightly rituals running around the hallways, she spooking the kids as they play under the house, the jolt where she finds the camera and picks it up while wandering off with a knife in her hand, and the great jump where the kids momentarily look out the door and find a body hanging from the tree. It all mounts to a wonderfully tense climax with Olivia DeJonge locked in a darkened room with the maddened Deanna Dunagan and Ed Oxenblould being humiliated with a faceful of pooey adult diapers. M. Night Shyamalan next stayed with Blumhouse for the split personality film Split (2017) and its sequel Glass (2019). Jason Blum and his Blumhouse production company have produced a number of other genre films including:- Hamlet (2000), Paranormal Activity (2007) and sequels, Insidious (2010) and sequel, Tooth Fairy (2010), The Bay (2012), The Lords of Salem (2012), The River (tv series, 2012), Sinister (2012) and sequel, Dark Skies (2013), Oculus (2013), The Purge (2013) and sequels, the tv mini-series Ascension (2014), Creep (2014), Jessabelle (2014), Mercy (2014), Mockingbird (2014), Not Safe for Work (2014), Ouija (2014) and sequel, 13 Sins (2014), The Town That Dreaded Sundown (2014), Unfriended/Cybernatural (2014), Area 51 (2015), The Boy Next Door (2015), Curve (2015), The Gallows (2015), The Gift (2015), Jem and the Holograms (2015), The Lazarus Effect (2015), Martyrs (2015), Visions (2015), The Darkness (2016), Hush (2016), Incarnate (2016), The Veil (2016), Viral (2016), Amityville: The Awakening (2017), Get Out (2017), Happy Death Day (2017), The Keeping Hours (2017), Split (2017), Stephanie (2017), Bloodline (2018), Cam (2018), Delirium (2018), Halloween (2018), Seven in Heaven (2018), Truth or Dare (2018), Upgrade (2018), Ma (2019), Relive (2019) and Sweetheart (2019).